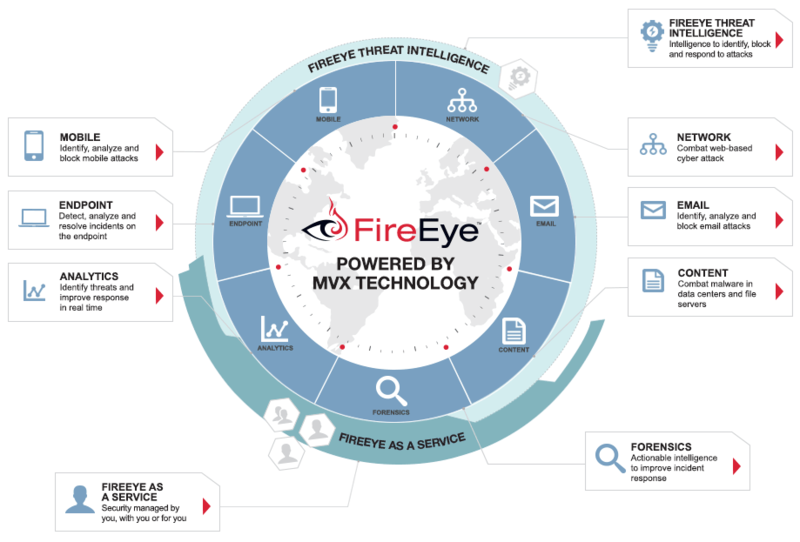 FireEye has invented a purpose-built, virtual machine-based security platform that provides real-time threat protection to enterprises and governments worldwide against the next generation of cyber attacks. These highly sophisticated cyber attacks easily circumvent traditional signature-based defenses, such as next-generation firewalls, IPS, anti-virus, and gateways. 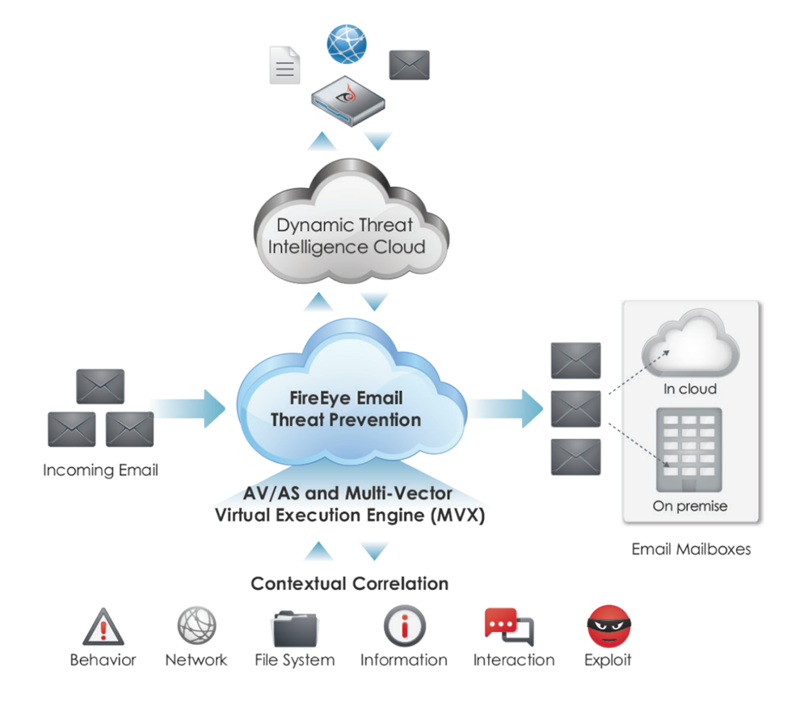 The FireEye Threat Prevention Platform provides real-time, dynamic threat protection without the use of signatures to protect an organization across the primary threat vectors and across the different stages of an attack life cycle. 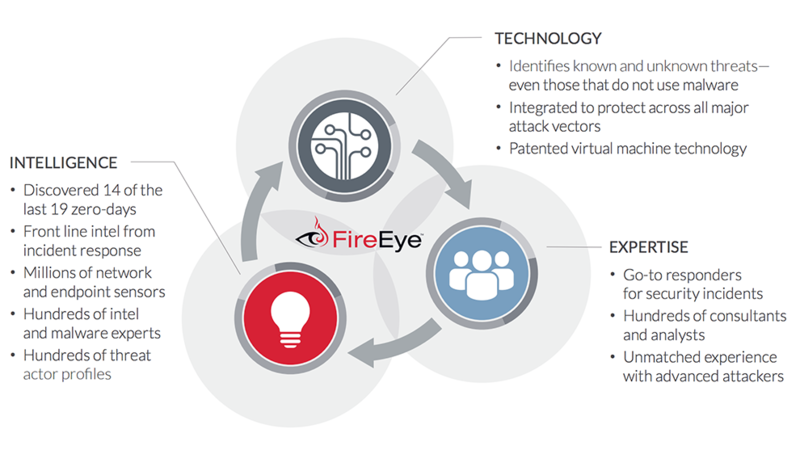 The core of the FireEye platform is a virtual execution engine, complemented by dynamic threat intelligence, to identify and block cyber attacks in real time. Cyber criminals often use spear phishing attacks, as well as malicious file attachments and URLs in emails, to launch an advanced cyber attack. These email attacks routinely bypass email security that uses conventional signature-based defenses such as antivirus (AV) and antispam filters (AS). FireEye Email Security products (EX and ETP) protect against such cyber attacks. These products detonate and analyze suspicious email attachments and embedded URLs and block malicious activity to enhance email security. With these capabilities, organizations can prevent, detect, and respond to email-based cyber attacks. AV and anti-spam protection are available to handle casual attacks and nuisance traffic. And customers can select Email Threat Prevention Cloud (ETP) for a complete, off-premise email security solution with no hardware or software to install. FireEye File Content Security (FX Series) products help prevent, detect and respond to cyber attacks by scanning file content for signs of malicious threats. These threats might be brought into an organization from outside sources, such as online file sharing services and portable file storage devices. To reduce the impact of a security incident, organizations should focus on early detection and swift investigation. Enterprise forensics makes this possible. When attacked, an enterprise needs to be able to rapidly investigate and determine the scope and impact of the incident so they can effectively contain the threat and re-secure their network. The FireEye Network Forensics Platform (PX series) and the Investigation Analysis system (IA series) are a powerful combination, pairing the industry's fastest lossless network data capture and retrieval solution with centralized analysis and visualization. Enterprise forensics combines high performance packet capture with analysis tools to aid investigation efforts. It complements several other FireEye threat prevention and detection capabilities. Most deployed endpoint systems use traditional security that relies on signature-based defenses. Skilled attackers can readily bypass these defenses. Organizations need to address this security gap. FireEye now offers its industry-leading threat detection capabilities from the network core to the endpoint with FireEye Endpoint Security (HX Series). With this solution, you can enhance endpoint visibility and enable a flexible and adaptive defense against known and unknown threats. Endpoint Security automatically updates your endpoints with available threat intelligence and inspects them to see if there is a corresponding threat or indicator of compromise (IOC) when FireEye detects an attack anywhere in a network. Compromised endpoints can be isolated with a single click while security teams use the Enterprise Security Search feature to identify known or unknown threats on other endpoints. Security teams can also use the Data Acquisition feature, which allows analysts to inspect compromised endpoints and analyze gathered information to create custom IOCs and address previously unknown threats. As a result, security teams gain deeper insights into attacker behavior and tools via detailed information on the vulnerabilities and risks of your on- and off-premise endpoints. Malware analysis is an important part of preventing and detecting future cyber attacks. Using malware analysis tools, cyber security experts can analyze the attack lifecycle and glean important forensic details to enhance their threat intelligence. Technology alone will not defeat a determined attacker. You also need expertise and intelligence. With every new layer of cyber security you put in place, the attackers respond by evolving their own tools and techniques. To combat this constantly changing threat you, too, need a new approach: FireEye as a Service. Having swift detection, analysis, and response means attackers never gain a foothold and your business assets stay safe.